After a short breakfast session at KL Sentral, me, Benny and Jai Carbolic Smokeball started our journey to Johor Bharu. 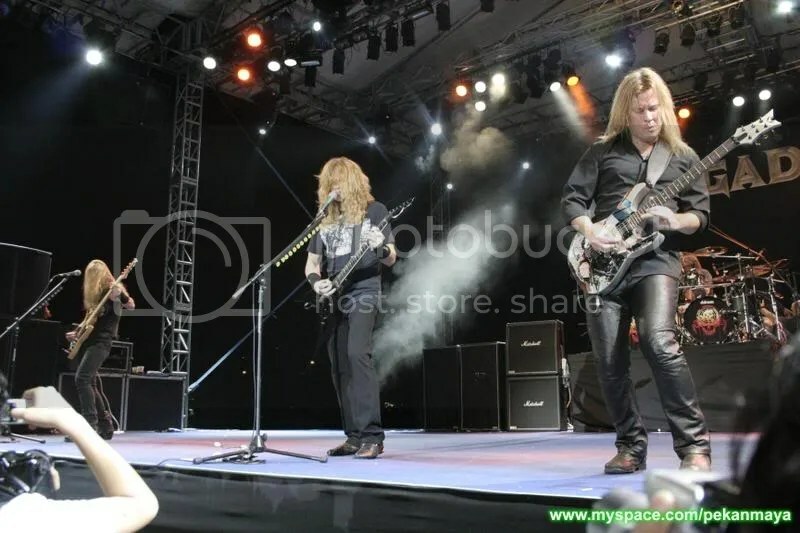 We took a rest at a hotel in Stulang, before entering Singapore at 5.00 p.m. At 9.00 p.m, Mustaine started the show with new single Sleepwalker from United Abomination. The crowd started to mosh when Mustaine started riffing with his Dean VMNT. The combination of Glen Drover, Shawn Drover and James Lomenzo is the best since Friedman, Menza and Ellefson era. Mustaine definetely proved that he’s a hell of a front man with his energetic performances. Classics tunes as take No Prisoner, Wake Up Dead and Skin o’ My Teeth was played non stop by them. ” It take more than my house and Lomenzo’s to burn than to stop us from playing in front of you lovely people” said Mustaine commenting about the fire tragedy in his hometown. this was followed by Washington Is Next. “I hope that you’ll know French” said Mustaine before starting A Tout Le Monde followed by Darkest Hour and Hangar 18. Encore for the night was a modified tunes of Holy Wars with some mixture of the Four Horsemen.